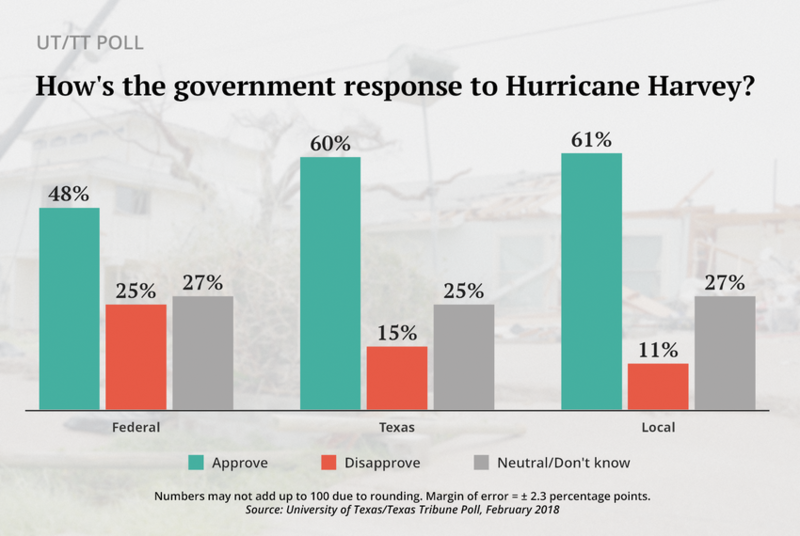 Texas voters’ approval toward the federal government’s response to Hurricane Harvey fell since we last checked in October, from 57 percent to 48 percent, according to the latest University of Texas/Texas Tribune Poll. State and local governments are getting higher grades than the federal government for their responses to Hurricane Harvey, according to the latest University of Texas/Texas Tribune Poll. Overall, all three levels of government are getting more good marks than bad. Local governments are the favorites here, with 61 percent of voters saying they approve of the local government response and only 11 percent saying they disapprove. State government’s numbers are similar: 60 percent approve, 15 percent disapprove. The federal government lagged a bit behind, with 48 percent saying they approve of the federal response and 25 percent saying they disapprove. In the October 2017 UT/TT Poll, 57 percent of voters gave good marks to the federal response. Since then, approval among Republicans has slipped from 76 percent to 61 percent. Among Democrats, those numbers didn’t change. Voters were also asked about the news media and insurance companies in relation to Harvey, and the responses from those institutions fell short of local and state government in the eyes of voters. The news media, with 45 percent approval and 24 percent disapproval, ranked right alongside the federal government. Insurance companies got approving nods from 26 percent and disapproving marks from 29 percent of voters but also left 45 percent saying they had a neutral opinion or no opinion at all. Who should draw the state’s political maps? States redraw the political lines for congressional delegations and their legislatures every 10 years following the U.S. Census. Texas and a number of other states have been litigating their current maps since 2011, boosting calls for reforms — including proposals to take the mapmaking power away from lawmakers and handing it over to politically independent commissions. That gets a mixed response in Texas. More voters are for it (44 percent) than against it (27 percent), but there is a strong party divide. In a state where one party has a lock on all of the statewide offices and large majorities in the congressional delegation, the state Senate and the state House, that’s probably not a surprise. More than 60 percent of the out-of-power Democrats favor an independent commission, while only 28 percent of Republicans who hold the majority agree that a commission should take over. That said, where one in four Democrats didn’t take a position, 35 percent of Republicans said either that they don’t know of have no opinion.